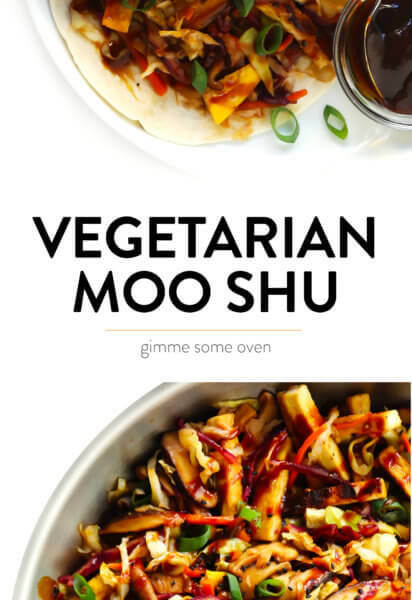 This Vegetarian Moo Shu recipe is made with a colorful mix of veggies, eggs, and the most delicious hoisin-sesame sauce. Feel free to add in crispy tofu if you’d like! 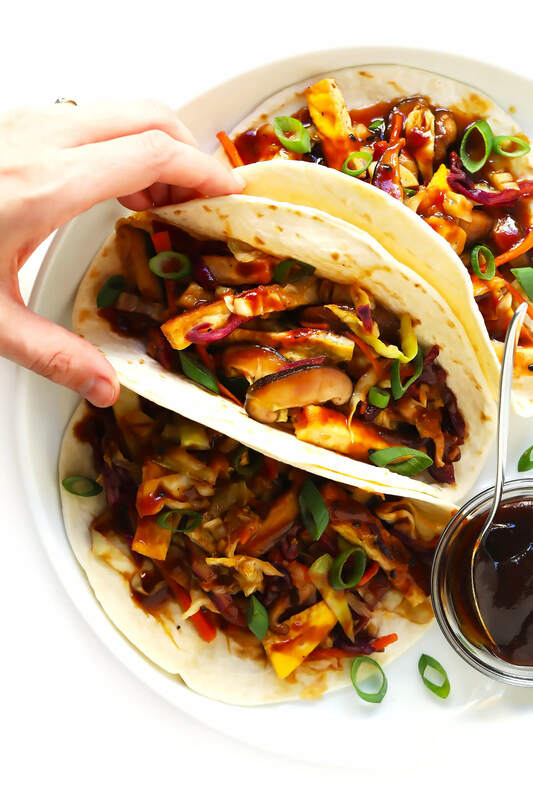 This retro-Chinese-restaurant classic is the best of both worlds — all of the fresh flavors of a veggie stir fry, loaded into a soft tortilla “taco”, then drizzled with the most delicious hoisin-sesame sauce. And we are obsessed. Well — I should say that I was originally obsessed with moo shu pork for many years. But once my vegetarian husband came into the picture, we switched over to a crispy tofu version. And I haven’t missed the meat in this dish ever since! That said, if tofu isn’t your thing, don’t worry — this hearty veggie stir-fry will stand on its own without the tofu just fine. It also makes for fantastic leftovers, if you’re planning for the week ahead. 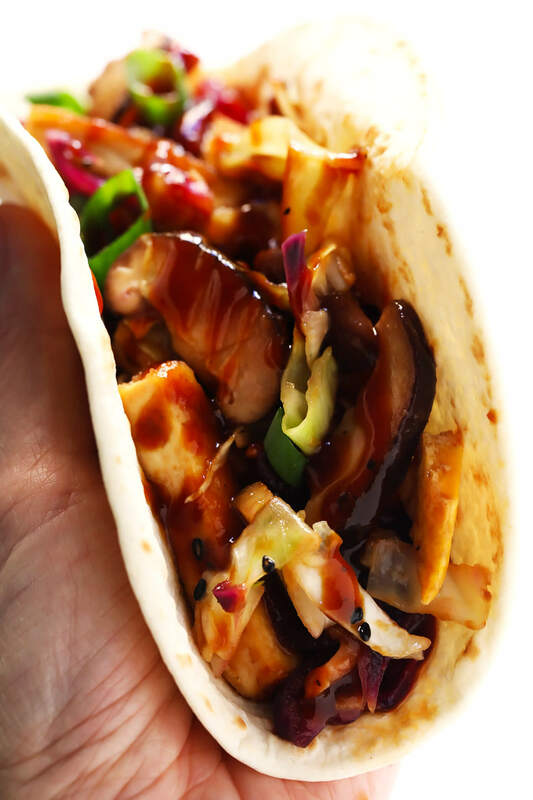 And if you want to mix things up even more with said leftovers, I can vouch that this vegetarian moo shu also tastes delicious served in lettuce cups, or over rice or quinoa or even salad greens. Basically, you’ve got options! And lots of reasons to try this one, stat. Alright, let’s talk ingredients. I feel like I should first point out that this recipe is based off of the American-Chinese restaurant version that I grew up with. Authentic Chinese moo shu is made instead with cucumber and a slightly different sauce. But this version is made instead with one of my favorite shortcut ingredients — a bag of coleslaw. I recommend looking for one of the varieties that also has shredded carrots mixed in (plus maybe a bit of red cabbage too, for color). Or if you happen to be living in a country outside of the States where coleslaw isn’t sold, you can just shred your own cabbage and carrots from scratch! Tofu: Again, this is optional. 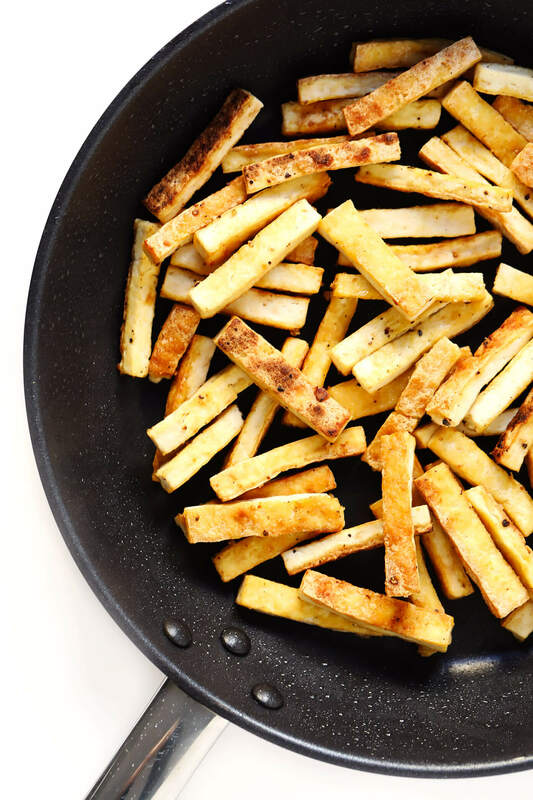 But if you would like to add tofu, we will toss it with cornstarch, salt and pepper, to make it nice and crispy, and then cook it in a tablespoon of oil on the stovetop. Eggs: These will be cooked into a quick little omelet, which we’ll then chop up and add to the stir-fry. 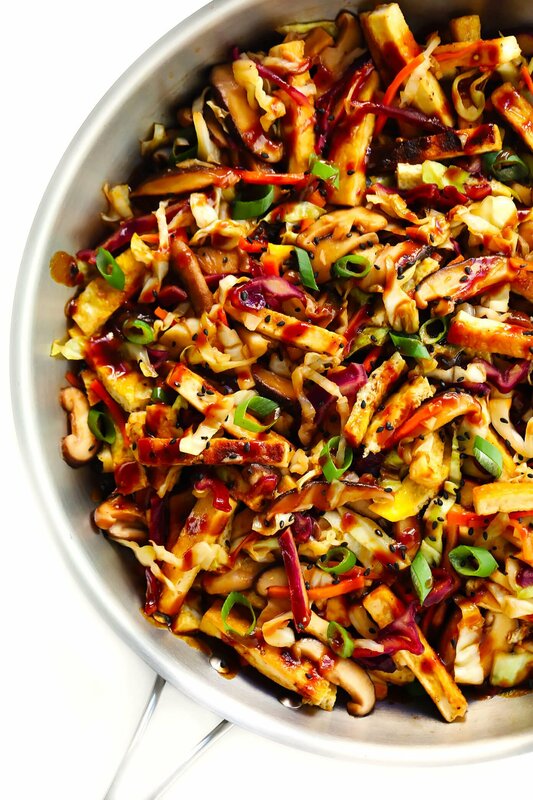 Mushrooms: I highly recommend using shiitakes for this recipe. But baby bellas could also work as a substitute. Garlic: To help season the stir-fry. Coleslaw: The recipe calls for a large bag, which will reduce down significantly as the cabbage cooks. Flour tortillas: Or you’re welcome to use authentic Chinese pancakes, either store-bought or homemade. I almost always just use flour tortillas because I keep them on hand. So here’s the thing about making tofu on the stovetop — it’s 100x easier if you have a non-stick sauté pan. (Don’t forget, a seasoned cast iron pan is naturally non-stick too!) If you don’t have a non-stick pan, you’re welcome to bake your crispy tofu in the oven instead. Up to you! Cut the block of tofu into thin slabs. 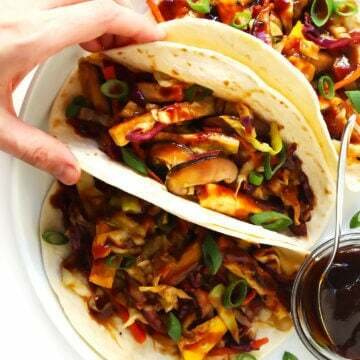 I like my tofu nice and thin for this recipe, so that it fits easily into the tacos. So I recommend cutting your tofu into large, thin slabs (about 1/4 to 3/8-inch thick). Drain the tofu. Then lay out a double layer of paper towels on a flat surface (like a cutting board). Place the tofu slabs in a single layer on top of the paper towels. Cover them with another layer of paper towels. Then place another cutting board (or a cookie sheet, or something flat) on top of the tofu, and weight it down with some heavy pots and pans or cans on top of it. Let the tofu sit and drain for about 15-30 minutes. Cut the tofu as desired. Then cut the tofu into your desired size/shapes. You could do skinny strips like me, or squares, triangles — you name it. Coat the tofu. Transfer the tofu to a mixing bowl, and toss with cornstarch, salt and pepper to season it and help make it extra-crispy. Stir-fry the tofu. Then heat some oil in your non-stick sauté pan. Add the tofu in a single layer. (You may need to do this in two batches, if your pan isn’t very big.) Then don’t touch it for a few minutes! You want the bottom sides of the tofu to get nice and golden and crispy. Take a lil’ peek, and once they look ready to go, flip the tofu and cook on the opposite side. Then cook it for a minute more, stirring and tossing occasionally, and it’ll be ready to go. I promise, this sounds more complicated than it actually is. ;) Just be sure to start on the tofu first so that it has time to drain. And of course, if you’re anti-tofu, you can skip this entirely. Also, to save time, I typically multitask and cook the tofu at the end of the recipe in a separate pan alongside the stir-fry, just to save a few minutes. Cook your tofu. As mentioned above. Make your sauce. Just whisk everything together in a bowl until combined! Combine everything. Add the tofu, egg, and 2/3 of the sauce into the pan along with the veggies, and toss until combined. Serve warm. Either in flour tortillas, lettuce cups, or over rice or quinoa — you pick. Drizzle with the remaining sauce, and top with lots of green onions and toasted sesame seeds, if desired. And — enjoy!! Use smoked tofu: If you don’t want to mess with cooking the tofu, you’re welcome to use firm smoked tofu instead. Add in extra veggies: If you want to skip the tofu altogether, you’re welcome to add in any other stir-fry veggies that you love, such as broccoli, red peppers, snap peas, etc. Use different mushrooms: As mentioned above, you’re welcome to sub in baby bella mushrooms if you can’t find shiitakes. Or you could also use wood-ear (“black”) mushrooms, which are traditionally used in moo shu. Make it spicy: Feel free to mix in some chili garlic sauce, if you would like an extra kick. Hope that you all enjoy this one! And cheers to mixing things up on “taco” night! 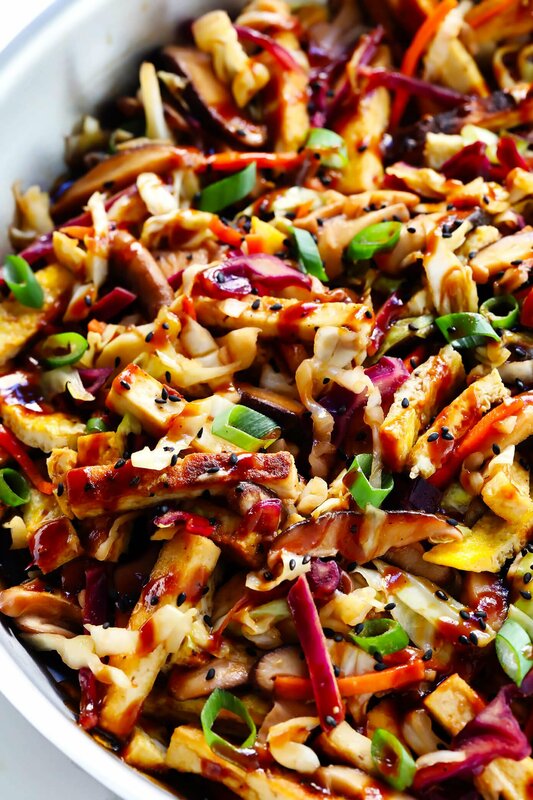 This Vegetarian Moo Shu recipe is made with a colorful mix of veggies, eggs, and the most delicious hoisin-sesame sauce. See notes above for possible ingredient substitutions. Prepare the crispy tofu (if using) and sauce. See instructions below. Meanwhile, heat 1 tablespoon oil in a large non-stick sauté pan over medium heat. Add the whisked eggs and let then cooked undisturbed for 2-3 minutes until they are mostly set and form an omelet. Flip the omelet and cook for 1 more minute on the second side. Then transfer the omelet to a separate cutting board, and roughly chop it into small, thin pieces. Set aside. Return the pan to the stove, and increase heat to high heat. 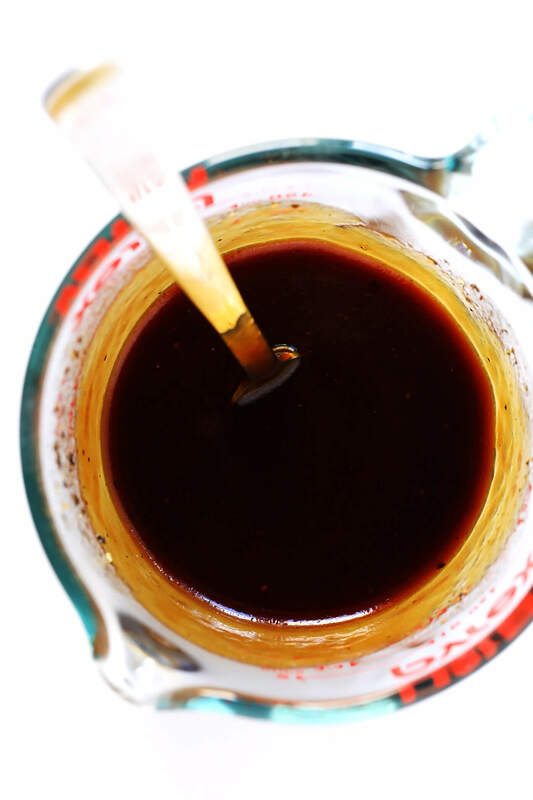 Add 1 more tablespoon of oil and heat until shimmering. Then add the mushrooms and sauté for 3-4 minutes, stirring occasionally, until cooked and lightly browned. Add the coleslaw and half of the scallions. Saute for 2-3 minutes more, or until the cabbage has softened to your liking. Add in the cooked tofu, 2/3 of the sauce, half of the green onions. Toss until combined. Serve over flour tortillas, lettuce cups, rice, or quinoa. Drizzle with the remaining sauce, and sprinkle with your desired garnishes. Then serve warm and enjoy! Slice your block of tofu into 1/4-inch-thick slabs. Lay some paper towels or a clean tea towel on a large flat surface, like a cutting board, and lay the slabs in a single layer on top of the paper towels. Cover with another layer of paper towels. Then place a second cutting board on top of the tofu, and stack a bunch of heavy cans or pots or whatever you can safely balance on top of the cutting board. The idea is to put a lot of pressure/weight on the tofu, which will help the excess water to press out into the paper towels. Let the tofu drain for at least 15-30 minutes. Once the tofu is ready to go, slice it into your desired shapes. (I made thin strips, which you can see in the photos above.) Add the tofu to a large mixing bowl, sprinkle it evenly with the cornstarch, salt and pepper. Then toss until the tofu is evenly coated in the cornstarch mixture. Heat oil in a large non-stick sauté pan over medium-high heat. Add the tofu and arrange it in a single layer. (You may need to do this in two batches if your pan isn’t large enough for the tofu to all fit in a single layer.) Cook the tofu undisturbed until it is browned on the bottom side, about 2 minutes. Flip the tofu and cook until the second side is browned, about 1-2 minutes. Give the whole mixture a gentle toss and cook for 1 more minute, stirring occasionally, until the tofu is browned to your liking. Transfer the tofu to a clean plate and set aside until ready to use. **If you would like to speed this recipe up, I recommend multitasking with two sauté pans. Use one to cook the egg omelet, followed by the tofu. (<– If you only have one non-stick pan, use it here!) And use the other pan to cook the stir-fry.